The Gaspe Peninsula (properly, the Gaspésie or Gaspé Peninsula, pronounced Ga-spay-zee or Gaspay, respectively) is a region of eastern Quebec. Its geography puts the Gaspe Peninsula in close proximity to the Atlantic provinces and has many maritime features, including rugged shorelines, fine fishing, and a laid-back, friendly population. The Gaspe Peninsula is a mostly coastal region of eastern Quebec surrounded by the St. Lawrence waterway as well as by the Bay of Chaleur. The Gaspe Peninsula is 560 km from Montreal and 340 km from Quebec City by road. VIA Rail makes stops along the Gaspe Peninsula. An overnight train from Montreal gives passengers a lovely seaside view in the morning. Orléans Express is a Quebec bus service that goes to Gaspe from Montreal International Airport, downtown Montreal, Quebec City amongst others. Air Canada flies into Gaspe with connecting flights in Montreal or Quebec City. Ferry service is available to the Gaspe north shore from Quebec and to the south shore from New Brunswick. The drive from Montreal to the western edge of the Gaspe Peninsula is about seven hours. Continue on another six or seven hours, and you'll reach the town of Gaspé at the eastern tip. From the Maine / Canada border, the drive to Gaspe is three or four hours. For a more comprehensive understanding of the St. Lawrence Quebec and maritime region, consider the Mighty Saint Lawrence cruise aboard Adventure Canada. Many of the most popular activities in Gaspe involve the outdoors and nature discovery. Things to do include whale watching and sea excursions, kayaking, bird watching, salmon fishing, lighthouse and architectural tours, hiking, and scenic drives. 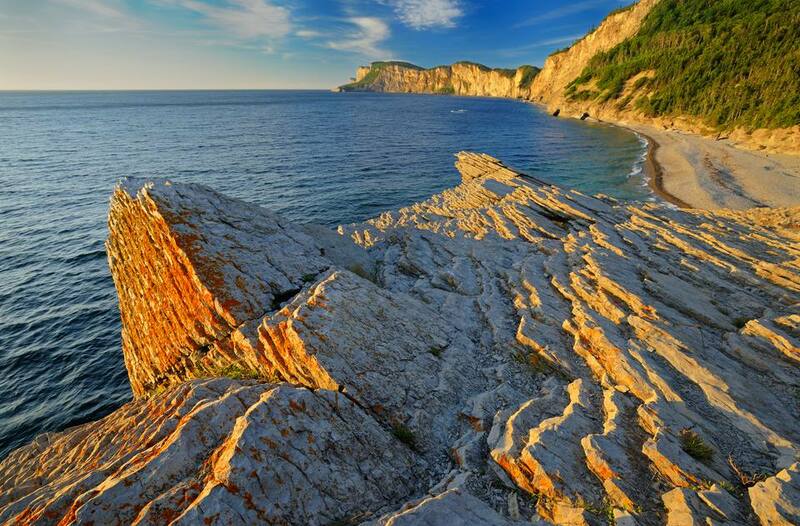 Outdoor adventurers will love the nature sites around Gaspe as well. Percé is a quaint scenic town, famous for its pierced rock formation. Bonaventure Island is a fascinating little island a short ferry ride away from Percé. Formerly a fishing village, today the island is one of the largest and most accessible bird sanctuaries in the world. Gaspe is home to several national parks, including Forillon National Park near the town of Gaspé and the Parc national de la Gaspésie in the peninsula's mountainous interior. The Gaspe Peninsula is accessible year round. Winter offers cross-country skiing and some downhill skiing. As the weather warms up in spring, a fuller breadth of outdoor activities becomes available, such as whale watching, sea kayaking, birdwatching, and just meandering the gorgeous countryside. June and July are the most popular months for whale watching when the massive mammals pass close to shore seeking food. May and June attract birdwatchers as the peninsula is part of the Atlantic flyway. Many seabirds nest at Forillon National Park and Bonaventure Island during the summer months. September/October migration—amidst colorful fall foliage—also draws significant visitors. Though French is the prevalent language on the Gaspe Peninsula and some people you meet will not speak English, for the most part, English is widely understood, especially in tourist towns like Perce, at train stations and restaurants. Residents of Gaspe tend to be laid back and the degree of "haughtiness" that some visitors encounter in Quebec City, for example, is less likely here. Nevertheless, it bodes well to brush up on some French phrases for travelers. Pick up a dictionary or download a translating app, as English in this rural part of Quebec is less prevalent than in cities like Montreal or Quebec City. Don't expect to stay at major hotels in the Gaspe. Accommodation ranges from remote cabins to lodges and small resorts, which allow for a more intimate and authentic experience with the local people. Gîte du Mont-Albert is a gloriously placed lodge in Quebec's Gaspésie region with close access to the Chic-Choc Mountains.